Monique Lhuillier Stationery Now Available at Hyegraph Invitations & Calligraphy at the Embarcadero Center San Francisco California. Monique Lhuillier’s Fine Stationery Line is inspired by her Bridal Fashion which is a celebrity favorite. Among her clients who choose her garments for Wedding Gowns are Reese Witherspoon, Carrie Underwood, Ashlee Simpson and Alicia Silverstone. Monique Lhuillier’s Invitation Line includes designs that reflect Understated Elegance, Timeless Romance, Signature Favorite and Something old, Something New according to the titles of her Invitation Suites in her Album Monique Lhuillier Fine Stationery Collection which we now carry at Hyegraph Invitations & Calligraphy at Embarcadero Center in San Francisco California. Monique Lhuillier’s Understated Elegance Collection consists of an array of the finest papers, ribbons and printing processes according to the designer. Timeless Romance Collection of Stationery consists of beautiful details, sophistication and romance. Her Signature Favorite Collection uses ultra thick paper, classic font & monogram in two colors with printing on both sides. Monique’s Something Old, Something New collection uses exquisite lace as used in her wedding gowns, thick rich paper, embossed with Alencon lace pattern. This line also utilizes subtle colored satin sash similar to the accent of her gowns to give a splash of subtle color and variety to her Stationery collection. 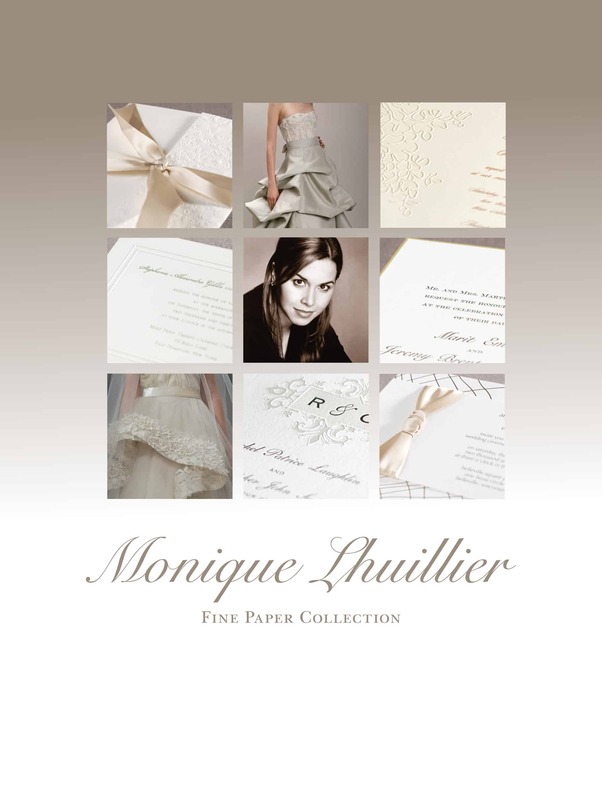 A nice feature Monique Lhuillier’s Stationery Line offers is three different styles of printing: including Engraved, Letterpress & Thermography available for most of her designs. This affords the client to choose her budget, still choosing the design he or she prefers but with the level of detail and budget he/she would like to spend on a particular event. 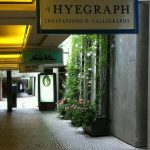 Engraved is the most lavish printing style, followed by beautiful Letterpress and the most affordable is Thermography. Engraved Printing which is the most costly choice and Thermography which is the most affordable both give texture to the characters where you can feel the printing under your fingertips. Letterpress is the opposite, it is debossed~ so you can feel the indentation of the characters on the paper. Two different methods with slightly different results: it’s up to the individual’s taste. Designer Wedding Gowns to Designer Wedding Invitations! We at Hyegraph Invitations & Calligraphy Embarcadero Center Invite You to view Monique Lhuillier’s Line first hand in our store. Since we work with 60 different companies across the globe you can compare her line to other fine stationery. Monique’s stationery with its varied styles, textures and soft tones along with the three printing styles it offers to clients is a great value for a designer product~ A fun idea to be inspired by her Designer Wedding Gown Collection to create a unique Fine Stationery Collection for Wedding Invitations, Save the Dates and Social Stationery. Congratulations to Monique on a gorgeous line of Designer Invitations for today’s fun, sophisticated bride and stationery connoisseur! 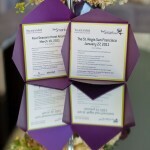 You can see more Monique Lhuillier wedding invitations & custom wedding invitations on our blog. To design custom wedding invitations and save the dates please see our website, or call or email or come in to our San Francisco Store. Shop Online if you’re not in the San Francisco Bay Area.